Let’s Throw a Pizza Party! I am not a huge sports fan per say but usually I keep up with my teams and with general sports happenings. Like I know enough to pick decent teams in March Madness, and what teams are headed to the world series and usually who are the hot shots playing in the Super Bowl. In fact, last year I was in Dallas for all the Super Bowl excitement (Pakers- 31 vs Steelers- 25). But this year, this year, I have been so outta the loop. It almost completely slipped my mind that this coming Sunday is Super Bowl XLVI. I actually had to do a Google search and find out WHO was playing in this year’s big game (btw it is the New England Patriots and the New York Giants) and who was the honorary host city (Indianapolis). So I decided I should take it upon myself to help you prepare for the big snacking game day! This week on Kitchen Concoctions will be pizza week! I can’t think of what goes better with football watching than pizza?!? First up, I am sharing an article that I wrote for meal planning/recipe site Food on the Table, with tips and tricks on how to host a perfect pizza party! Have a birthday party, sporting event, or family game night in the near feature? Well why not throw a pizza party? 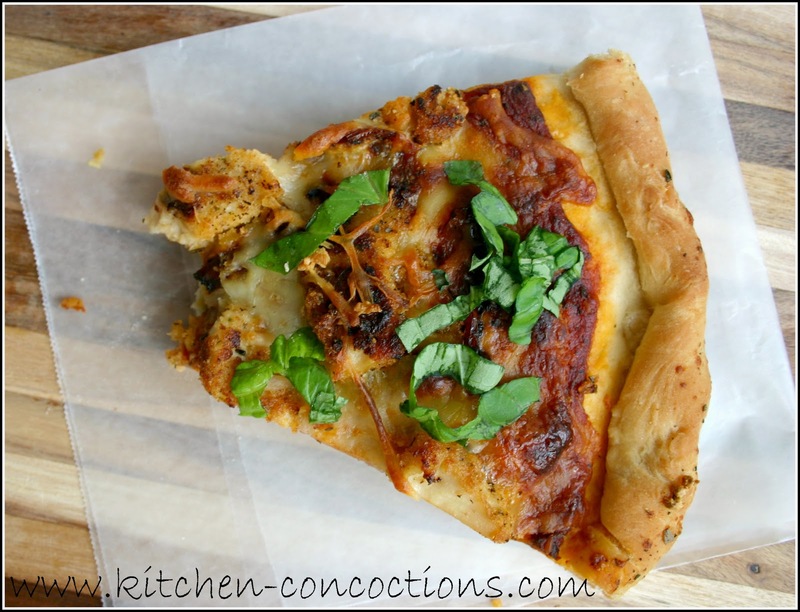 Pizza is a food that is loved by kids and adults alike and sure to be a party pleaser! For a quick, easy, inexpensive menu, there’s nothing like having a homemade pizza bar to please every taste. Here are some great ideas for throwing the perfect pizza party. Be organized: Prepare and chop ingredients before the party. Place toppings in assembly-line order and in easy to serve containers with appropriate utensils. The dough: Thin crust or thick? Pick one style or serve an assortment to please the crowd. Purchase frozen, refrigerated, or prebaked crusts from your local grocery store and prepare according to the package directions. Or try your hand at making a delicious homemade crust. Be sure and have plenty of crusts ready with enough pizza pans or the grill fired up and ready to go. The sauce: Store bought pesto, classic marinara, or homemade alfredo are all tasty options. The toppings: Choose good-quality readily available fresh ingredients. Great pizza toppings include pepperoni, sausage, Canadian bacon, pineapple, green apples, bell peppers, mushrooms, tomatoes, and onions. But really the possibilities are endless depending on your tastes and desires. The cheese: Of course the traditional cheese toping for pizza is mozzarella but try cheddar, provolone, bleu cheese, or parmesan. Make a toast: This is a party after all, but choosing age appropriate beverages is important. Beer and pizza go hand in hand, but for a girl’s night ‘in’ wine maybe more enjoyable. Also, if entertaining kids soda and fruit punch are a perfect pairing with pizza. Dessert: To keep with the pizza theme, make a dessert pizza! Simply use refrigerated sugar cookie dough as the ‘crust’ and bake as directed. When cool, smear on some cream cheese frosting for the ‘sauce’ and top with candy, fruit or even nuts! Pizza parties are fantastic way to have loads of fun without a whole lot of stress. The pizza recipes below will certainly be hits at your next pizza night! I'm only about the food when it comes to sports! I'm so excited for pizza week – love me some pizza! !